I love that ethereal green! Thanks Barks! It ended up a little more green than I originally intended actually, but well within ghostly palette parameters I think. From here those guys look really rather splendid. The riders look nice and solid, and the mounts look wispy and immaterial. It may be that they broke your heart working on them, but I say GUUD JAAAAAAB! 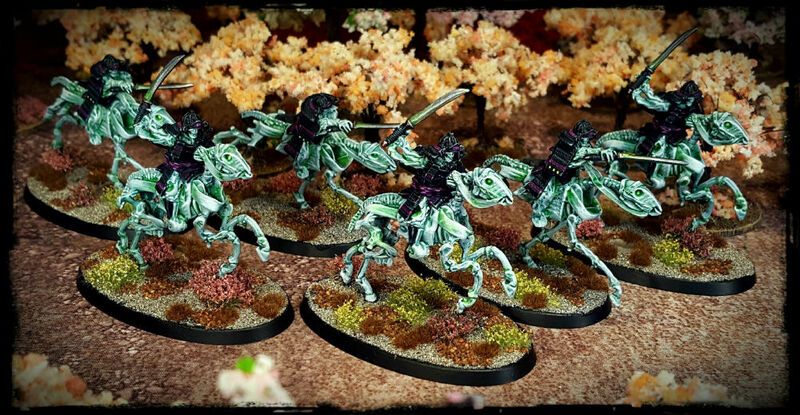 I have more undead cavalry lined up for this project as it happens. I think that what I learned while painting these will stand to me then, so hopefully the slog was worth it. Cracking job even when taking into account the pain they were ! Thanks A-Man! They took me far longer than I anticipated, but I got their in the end, stronger for the experience I think. The Champions of Law had better get practising their rites of exorcism. I don’t think i’ve seen cav on your blog before. All the variety of figures in your force are really just great. You havent seen cavalry here before as this is the very first completed 28mm cavalry unit that I have ever painted in my thirty years of hobby. Im glad that you like them. The variety is crucial to keep my interest up. Some people enjoy a factory line sort of production to their projects, and good luck to them. I dont though. The variety is what keeps me stimulated. This army is essentially a mythological feudal Japan force, rather than an undead force or a human force or an orc force etc. Conceptually, I am enjoying the idea that the force is an unlikely alliance brought about to defend their homeland, an enemy of my enemy sort of affair. So awesome looking, your paint job and basing are so clean and beautiful I’m jealous! Good stuff! Im glad that you like it Vongutenboom, thank you for the kind words. The painting and basing processes are all straightforward. Im not terribly good at complex blending etc, so its simply a series of simple steps performed in sequence. The more well chosen steps, the more “finished” the items appear. Its really that easy. Excellent; love the green colour. That green developed organically out of the process. My original intention was slightly different but didnt work as well as I had hoped. It turned out adequately, but I hope to refine it in future. These look really nice! The thought of batch painting six cavalry miniatures makes me break out in cold sweat though. Glad you’re ok! The process hung over me for about a month. My wife was relieved when I finished them, such a toll they had taken on the atmosphere at home. Six cavalry as a batch is mental. I will never do it again, although I am pleased that I got them finished at least. I was concerned for a while that if I took much longer that they would be abandoned, but not this time. Excellent work! Where are those miniatures from, may I ask? I should have put that info in the post of course Tomeu, silly of me. The figures came from Slave 2 Gaming. Thanks for the encouraging comment Tomeu! Well thank you! All of your entries are always engaging, but this Shonen Knives series is really something else! Congratulations!